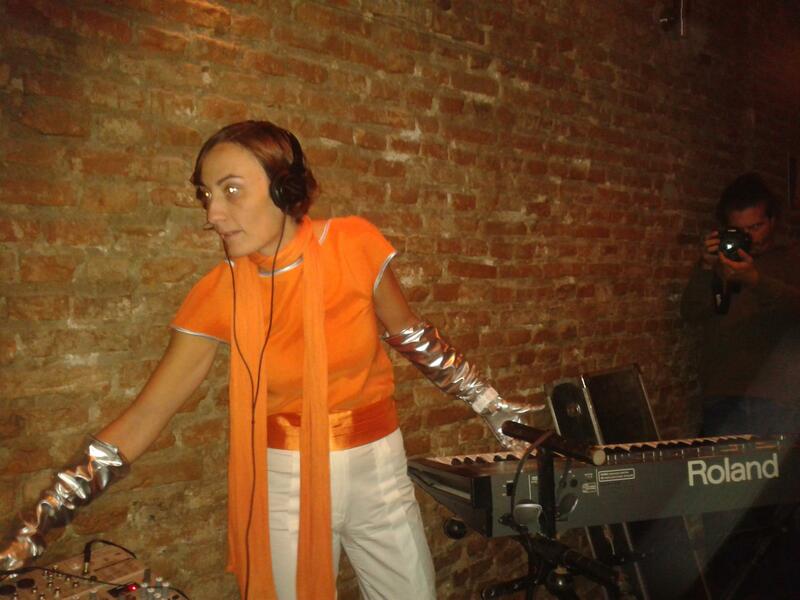 In October 2011 within the framework of the FrikFestival me and my dear friend Angelika had a performance at Damar bar, Skopje Republic of Macedonia entitled ‘Croncet for two’. Croncet is an anagram from Concert. The performance consisted of me playing on Juno keyboard and Angelika playing on bass guitar, while only two people, apart from us, were able to actually hear the ‘music’ since they wore headphones and were connected to our instruments. The rest of the audience was just having the visual overview of the show. Many many thanks to Samir Ljuma for shooting the videos and of course special thanks to Harald Schenker for complying everything and putting together the conceptual idea of the performance. Yes, to be continued…. The promotion was audio visual performance whereby the audience listened and read my poetry book ‘Exibition’ in a aesthetically decorated bathroom all in mirrors, in a gallery called ‘Public Room’. 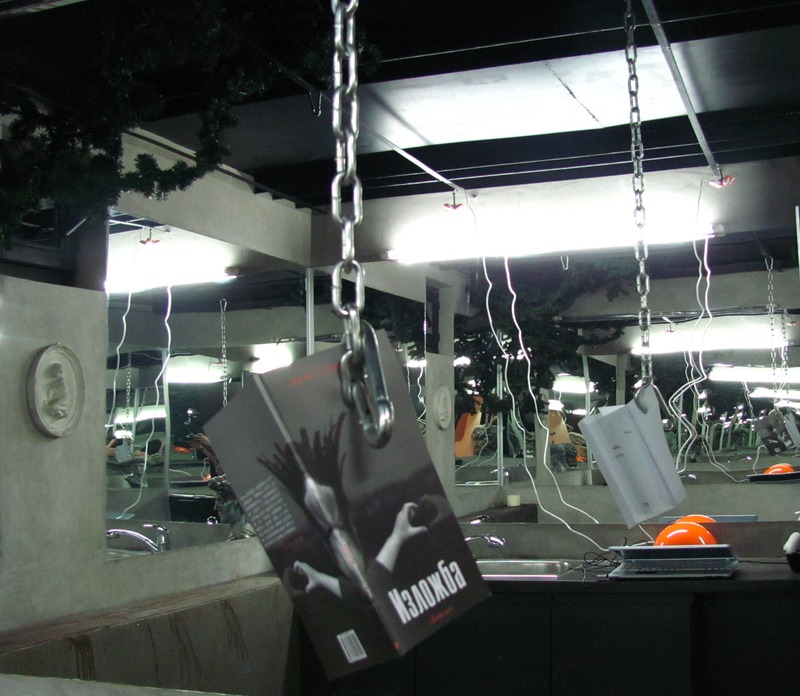 Me and my friend Toni read the poems on a audio with ambient music and sound effects in the background and also hanged on a chain a hard copy of the book. The audience listened, read and in same time saw its self reflection multiplied by 10 since were surrounded by multidimensional mirrors. It was great audio visual performance indeed. In October 2011 within the framework of the FrikFestival me and my dear friend Angelika had a performance in Damar bar, Skopje Republic of Macedonia entitled ‘Croncet for two’. Croncet is an anagram from Concert. The performance consisted of me playing on Juno keyboard and Angelika playing on bass guitar, while only two people, apart from us, were able to actually hear the ‘music’ since they wore headphones and were connected to our instruments. The rest of the audience, and I assure you Damar (great place with great parties going on:http://www.facebook.com/damarbar?sk=wall) was packed then, weren’t able to hear a thing. It was interesting conceptual performance for which in following period I will upload a video. However, it was amazing thing that the audience in anticipation to hear any kind of sound and noise on our part, was surprisingly silent. Photo is attached, more material to follow soon.